While most have heard about Nigerians fleeing Boko Haram, to Cameroon among other places, fewer know that refugees also cross the border in the opposite direction. In October 2017, an English-speaking minority in Cameroon declared the independent state of Ambazonia, resulting in the expulsion of many. These events have largely been ignored by the world press – but journalist Solomon Amabo tells some of the neglected stories with his photos. Attention is finite. So where should it be invested? What voices does the global media raise and what stories does it tell? And what gets left out? Getting attention through the global media can be difficult, and stories often do not reach beyond local or national interest until they reach a certain point of extraordinariness or tragedy. People living close to events rarely have input into how or where the stories are reported. Yet independent journalists anywhere in the world can be sources of stories, perspectives and change. 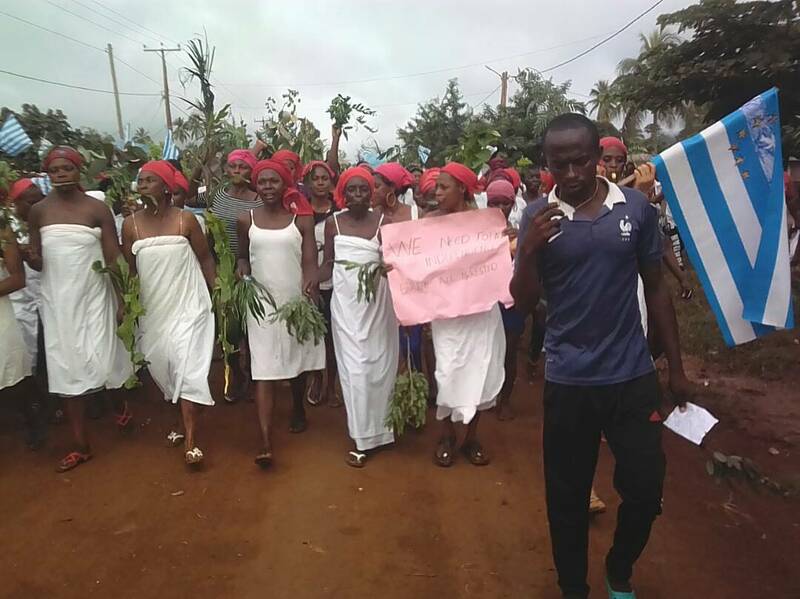 One such story is the story of the English-speaking minority in Southern Cameroon, who voiced their demand for an independent state in October 2017. 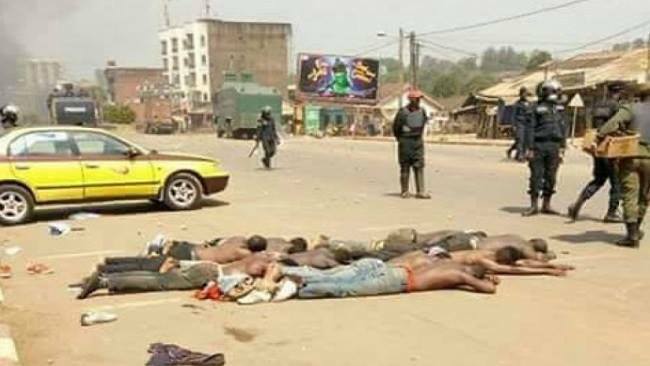 This demand was followed by a hard crackdown by Cameroonian security forces, which has caused thousands of people to flee from Cameroon to Nigeria. This story has hardly reached the international news, and most people outside of the region have not heard about it. However, ongoing violence is reported, and the hardships facing the refugees have not changed, with no prospect of a resolution in the near future. One voice drawing attention to this issue is the Cameroonian journalist Solomon Amabo, who is documenting the situation in pictures and in words. In collaboration with the journalistic photo-platform IndieFrame, his story about the Southern Cameroonian refugees in Nigeria is told. Over 2 million people are still displaced in North East Nigeria following the violent campaign of the insurgent group known as Boko Haram and the accompanying violence following security forces’ on-going attempt to defeat the group. In addition, hundreds of thousands of people have sought refuge in neighbouring regions. One of these countries is Cameroon, which has forcefully repatriated tens of thousands of refugees to Nigeria. 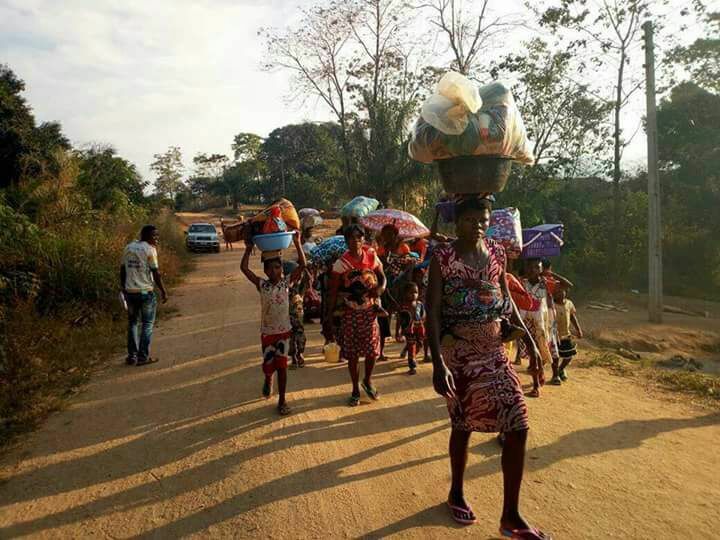 In late October 2017, the movement of people across the two countries’ borders was given a new dimension, as thousands of people from Southern Cameroon crossed the border to Nigeria. On 1 October 2017, the English-speaking minority in Cameroon declared an independent state: Ambazonia. The territory of modern day Cameroon was colonised by Germany from 1884 to 1916, when it was lost in World War I and divided among France and Britain, who held colonies to the east and west of Cameroon respectively. At Cameroonian independence in 1960, the northern part of what was then called the British Cameroons was included into the new, independent state: the Republic of Cameroon. But the southern part wanted to remain independent, and was not included until a year later, when the Federal Republic of Cameroon was announced. The people of what was already then referred to as Ambazonia – a name derived from a British missionary station at Ambas Bay established before German colonisation – did not agree to being included in the majority French-speaking state of Cameroon. Since then they have felt marginalised, and various legal, political and social claims for independence have been made. This sense of marginalisation seems only to be fuelled by the often heavy-handed responses of Cameroonian state security forces to claims of independence. The recent situation seems to be no different, as documented by Amabo. 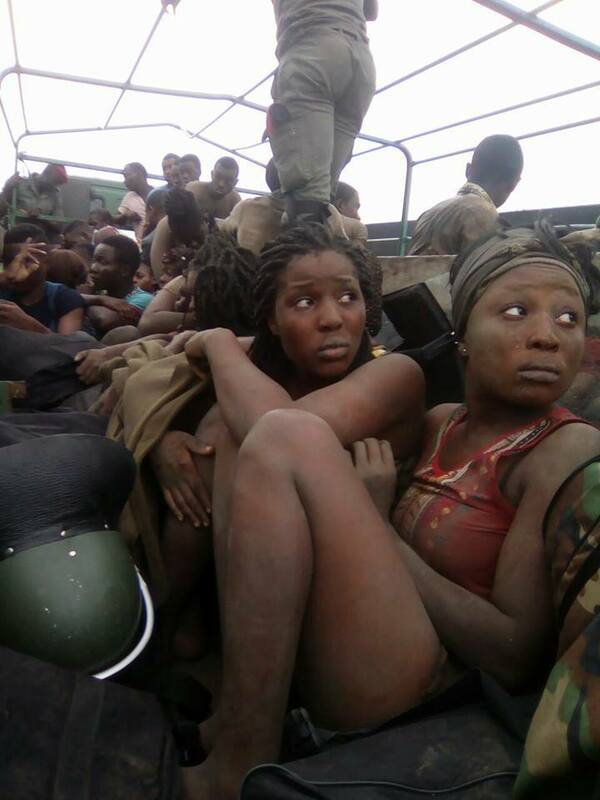 Refugees tell of Cameroonian security forces’ crackdown on villages and towns. Indiscriminately they ransack people’s houses, beat and arrest people. Some have died as a result, and many have lost valuables and possessions. Farmers are having agricultural equipment confiscated, as security forces fear it can be used as weapons. In the search for supporters of the Republic of Ambazonia, the security forces seem to operate arbitrarily and with impunity. The uncertainty people have to live with as a result seems to be the main motivation for fleeing. Whether you have or have not actively supported the call for independence, or no matter how you supported the call, you can be randomly targeted for beating, ransacking, arrest, or killing. Their eyes fixed on something outside the picture frame. Heads twisting with nervous looks on their faces. The thin layer of dirt covering their bodies from being forced to lie down in the yellow sand of Southern Cameroon. The crammed conditions in the back of the truck. The police helmet lying at their feet. The police officer with his back turned, hovering above their heads, standing upright, as if he is walking on the detainees. This picture taken by the Cameroonian journalist Solomon Amabo is a good example of how even a basic camera, such as the one on a smartphone, can tell the story of a situation by distilling a moment of it. As such technologies are becoming more widespread, more people on the ground can have a role in telling stories through pictures and words. Is the global media ready to democratise by including content which has traditionally had no route to a world audience? The detainees in the truck are students from the University of Buea in Southwest Cameroon, who have been arrested after joining teachers and lawyers in a protest against the Francophonisation of English educational institutions in Cameroon. 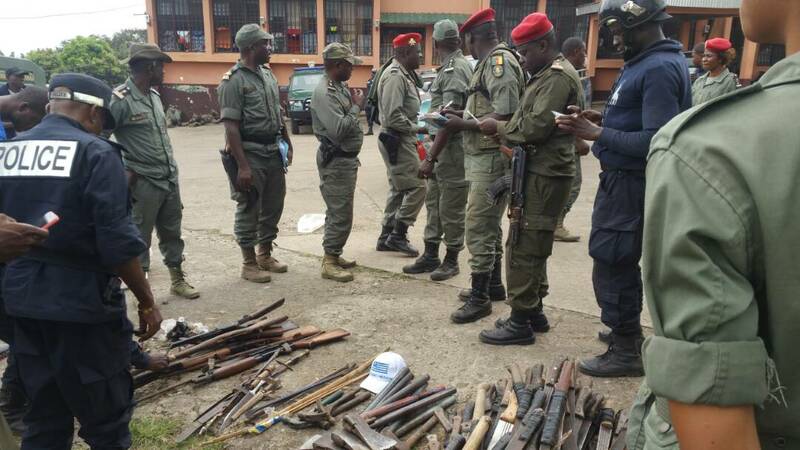 Cameroonian security forces confiscating farming tools from English-speaking Cameroonians. The tools are seen as a potential security risk. For the Cameroonians leaving for Nigeria only hardship awaits. As they often flee out of immediate fear of soldiers present in their areas, or because they were forcefully evicted from their homes, the refugees bring few possessions with them. The trek lasts days through mountainous forest terrain with little to eat. Hundreds of the women fleeing are pregnant. As reported by Solomon, many of these women flee through the mountains without proper food or clothes. When arriving in Nigeria, makeshift health care clinics have been established to accommodate the basis of their needs, like the Ranch Community Health Centre in Obudu Ranch. In a country where healthcare is often already insufficient, the clinics – who are mostly run by volunteers – report a serious lack of medicine, testing tools for HIV and equipment needed to deliver babies. Another group affected by the lack of basic health care are the predominantly male refugees who have suffered injuries after being brutalised by Cameroonian security forces. 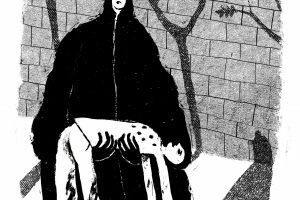 The wounds have been left untreated as they fled, and have in some instances developed into infections. Others have developed fungal infections as a result of the poor living conditions in the forests. In addition, sanitation in the camps has created concerns about potential spread of diseases like typhoid and dysentery. Open defecation remains the only way of relieving yourself, and water resources remain exposed. Reportedly, UNHCR and Rhema Care are the only international relief agencies operating in the areas hosting refugees from Southern Cameroon. 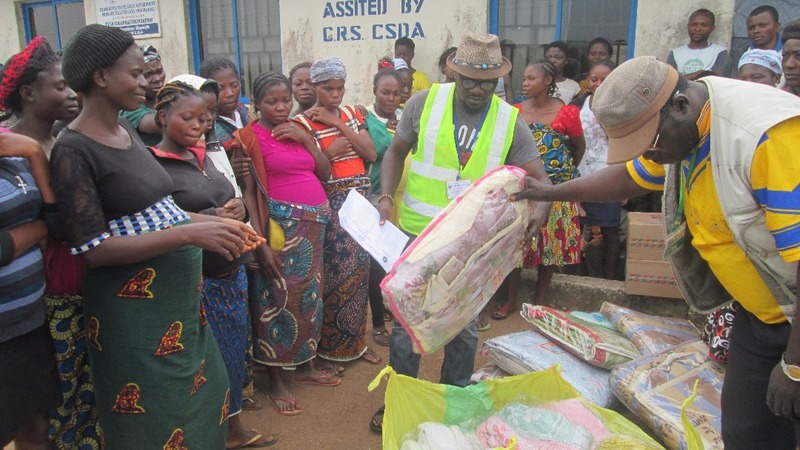 The Nigerian government and local communities are trying to provide for the refugees. But mistrust and the culture of corruption characterising parts of Nigerian society affect relief efforts. Refugees tell of border guards demanding bribes for entrance to Nigeria, and people from the local community have expressed discomfort with the presence of the refugees in their area. But the overwhelming reaction from locals has been to donate food items and allow the Cameroonian refugees sanctuary in Nigeria. According to UNHCR estimates, the world is witnessing an unprecedented refugee situation, with more than 65.6 million people forcibly displaced. The refugees from Southern Cameroon remain but a tiny fragment of this giant number. But they equally have a story worth telling. Such more or less untold stories remain communal and personal tragedies, and have the potential to become much worse stories as they spiral into larger crisis. By then, the global media and the people it serves will perhaps ask the question: why did we not do something? IndieFrame is an independent digital distribution platform that brings content, creator and the global media closer together. By supplying user-generated content from around the globe, the media will get stories through photos, video and words from local people. For more on the subject, follow Solomon Amabo’s blog.